Good afternoon, friends! 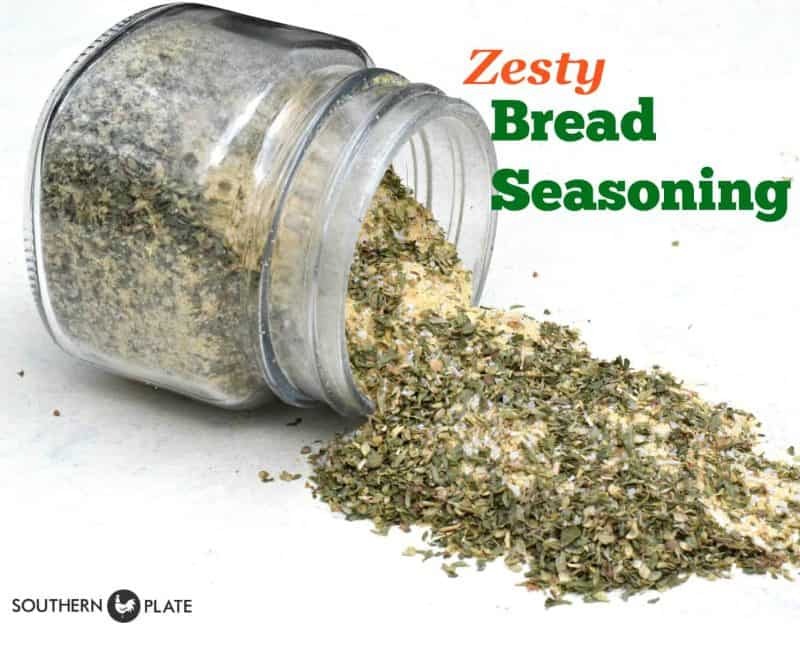 A few days ago I shared my recipe for Zesty Bread Seasoning and I mentioned that it could be used as an all purpose seasoning as well. Today, we’re going to do just that as I show you how to make some zesty baked chicken tenders! If you missed the post on how to make my seasoning, please click here. Scroll down to the bottom for a printable recipe card. This is easy as can be, reinforcing my sincere thought that the best food is simple food. In a world where it feels like folks are trying to impress you with an ingredient list that reads like an encyclopedia, lets just collectively sigh in relief while we use just three ingredients here. 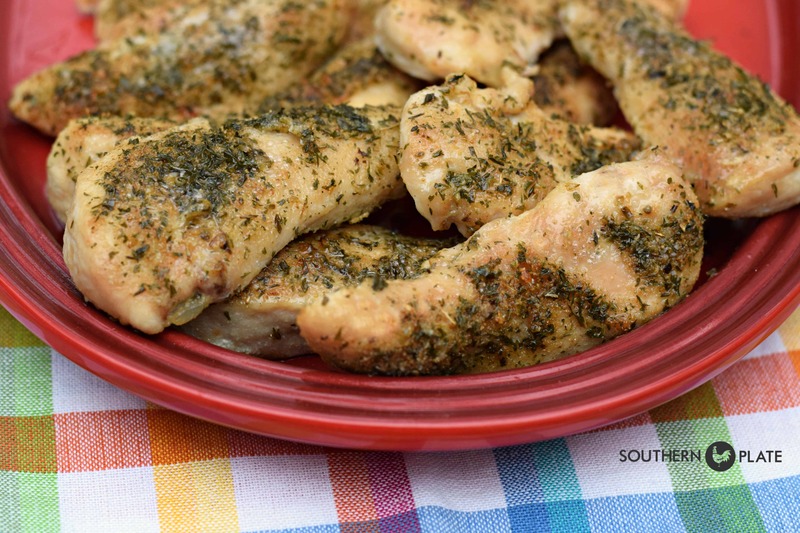 Zesty Bread Seasoning, Olive Oil, Chicken Tenders. That’s it! To make this, simply lay out your chicken tenders on a baking sheet. Brush both sides with olive oil and sprinkle both sides liberally with the seasoning blend. Bake at 350 for about 20-30 minutes, or until chicken is no longer pink in the center. If your tenders are thinner, they’ll be done sooner, thicker ones will need more time. 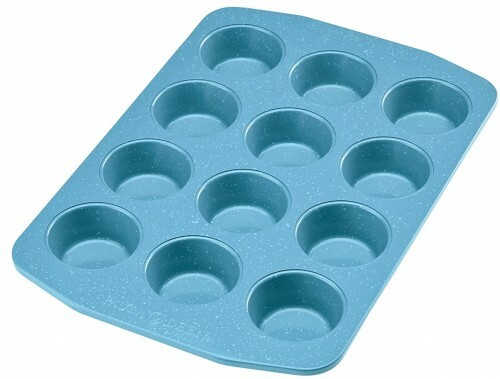 This is my new blue enamel baking sheet. It’s a great size because it is just a little smaller so two of them can fit side by side in the oven. They also have it in lavender. Click here to see them on Amazon. I may or may not have blue and lavender enamel muffin tins, too, but the inventory is low so skedaddle if you want one (click here). I hope your new year is off to a good start. I am enjoying a slower start this year as I spend time redecorating my living room and decluttering my house a bit. Ricky and I have enjoyed slower evenings as well, drinking coffee together and talking over our days. Consciously stepping back from the craziness of the world makes all the difference and I highly recommend it whenever you can! 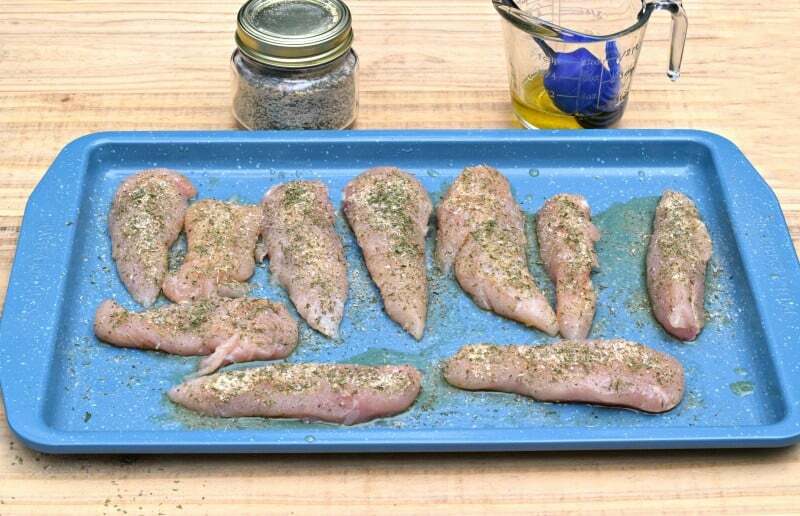 Spread chicken tenders out on a baking sheet. Brush both sides with olive oil and sprinkle liberally with seasoning. Bake at 350 until no longer pink in the center, 20-30 minutes. 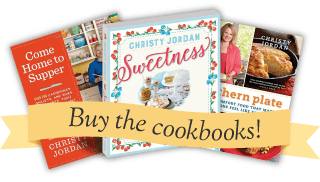 Did you know that I send out a free recipe newsletter a few times a week? When you subscribe, you also get a collection of over 30 printable recipe cards with my family’s favorite supper recipes. If you’d like to subscribe, just click here and fill out your name and email address. You’ll be sent a confirmation email with a button you have to click that says “Yes, subscribe me to this list” and then your welcome email will have the recipe cards for you to download and print. No one ever sees your email address but me and the subscription is entirely free. Looks good. Love your recipes. I hope that you and your family have a blessed new year. Love your recipes…I can find garlic powder, garlic salt but no garlic granules. Can I just use garlic powder instead? HI! Appreciate your recipes but love your stories even more! I have 2 questions: why did you say to use kosher salt? And it seems that chicken tenders have a weird vein or some whitish thing running down the length of them. Do people remove this before cooking? What is it? Hi Jenny,I cut those white (I think they are tendons) out of my tenders.I do not like the looks of them.I’m sure some people just cook them in,which I’m sure is alright to do. My friend Jyl won me over to Kosher salt a couple of years ago. The flavor difference is amazing, at least to me, so I often use it to cook with but still use iodized salt as my table salt. Another good thing is that it is very inexpensive so you can experiment and see if you like it better without being out more than a dollar or two :). Many folks cut the tendons off of the chicken as well, it’s just a personal preference. You generally can’t see them after the chicken is cooked. Thanks Christy,for the seasoning recipe.In the 90’s Crisco marketed a herbal oil,it was yummy brushed all over the chicken then baked.Do you remember this? I am going to try your seasoning recipe and hopefully will taste like the dis-continued Crisco herbal oil.Happy 2017 to you and you’re family. I must have just missed that Crisco oil but it sounds wonderful! Happy 2017 to you as well, Doris! My husband will not eat chicken with a bone, so he likes chicken tenders. He is addicted to CFA. I realized that I have boneless skinless chicken thighs from Costco. (I prefer dark meat and white meat tends to stick in my throat.) I could let this thaw a little and then cut them into tenders and do it this way. Maybe he wouldn’t notice….. They would need to cook a little longer, though, wouldn’t they? It would probably cook in about the same time but this method would easily adapt to boneless thighs. I’ve never seen those so I’ll have to look now! I made the Seasoning and added it to butter!! It was wonderful on toast and today I baked chicken thighs and put a couple of tablespoons under the skin!! WOW.. This is a perfect mix that you can adjust to your own taste. I’m going to add a little red pepper because we like some things spicy! Thank you for sharing your wonderful recipes and I LOVE your cook books!!! I am so glad you liked it Ruth!! Have fun making it your own!! 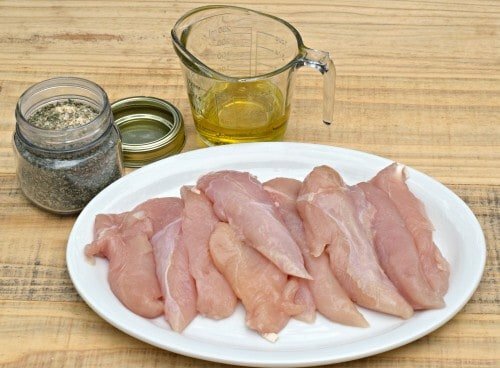 How would this seasoning mixture be on fish? I think it would work. I don’t eat seafood so I can’t say for certain but I would love to hear if you try it!! I think it would do great!